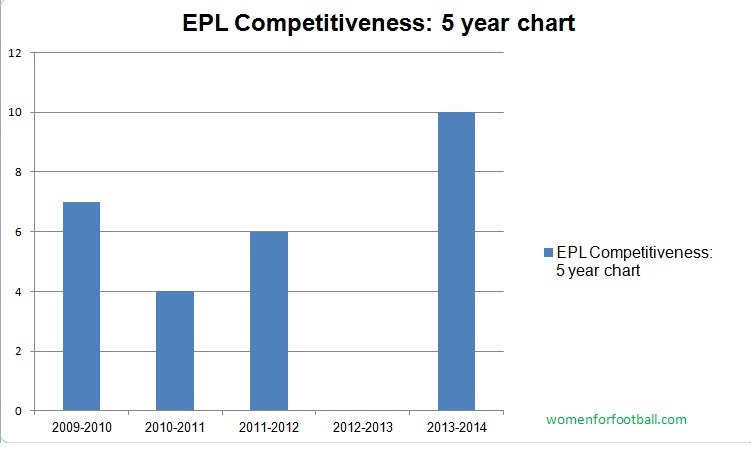 womenforfootball.com- 2013-2014 turned out to be a truly competitive season in English Premier League’s recent history. As the English Premier League come to an end this weekend, Manchester City and Liverpool fans are yet to know the fate of their beloved team. They do not know either whether to celebrate the title Championship or mourn over lost opportunity. “No kidding, EPL is always competitive”, some would say. Not really in fact; At least not in recent history. Thanks to Alex Ferguson’s memorable record in his last few years of career, and following Arsenal’s downfall, in addition to Chelsea’s constant managerial change, Manchester United remained the sole league title contender for years. Although that dominance changed slightly after Manchester City’s title win back in 2011-2012, competitive title race between two or three teams until dying minutes of the season have been rare in recent history of English football. o 3 points if less than 3 points. 1 point if 3 points. 0 point if more than 3 points. o 3 points if more than two teams in the race. 1 point if two teams in the race. 0 if no competition. o 3 points if less than 2 weeks ahead. 1 point if 2-5 weeks ahead. 0 if more than 5 weeks ahead. o If Midseason leader was different team than final Champion, 3 points. If the same team, 0 points. The same point system was done on each season of the past five years. Then total points for each season were summed up. The higher the total number, higher competition existed in that given season. As it is evident in the comparison chart below, this season marks the highest competitive season seen in recent history of EPL. In contrary, last season marked the least competitive season of the last five season: Where Manchester United became Champion of EPL as early as January 16th, 2013, 32 weeks left to the end of season, with significant point difference compare to runner-up team, without having any competition. No matter which of Manchester City and Liverpool celebrate 2013-2013 EPL trophy this weekend, it is an additional pride for their fans that they have succeeded in the most competitive EPL season of recent history.